Gigantic Launches Today, and it's Going to Surprise a Lot of People | Nerd Much? We typically don’t post these “X game launches today” type press releases that flood our inboxes every week. After all, it’s likely that if you cared enough about a game then you would already know when it’s launching. But, occasionally, a game launches without the spectacle and fanfare we feel it deserves, so we’re going to take every opportunity to shine a light on that game that we can. In this case, that game is Gigantic, the Xbox One console exclusive that launches on Xbox One and PC today. The free-to-play hero shooter is now available on STEAM, Arc, Xbox One, and Windows 10. Along with the game’s launch comes a small new content update that brings the game’s 19th hero, Ramsay — a blade-wielding heavy-hitter. He’s the first new hero to join the game’s original roster, and he’ll be followed by a new hero planned every month after launch. So, why should you care about Gigantic? Well, we’ve dropped over 20 hours in the beta so far, and we feel it’s going to surprise a LOT of people. Admittedly, we weren’t too crazy about what Gigantic appeared to be when it was first announced (mostly because of the free-to-play model). However, that free-to-play model is the painless version that you’ll find in games like Smite and League of Legends, where you have the option to purchase all characters for relatively cheap ($29.99 for an Ultimate Pack in this case). Or, if you’d rather not pony up the dough just yet, you can earn in-game currency that will allow you to purchase whatever character you want without any real money. With the free-to-play talk out of the way, it’s the game’s meat and potatoes that make it worth checking out. For one, it plays sort of like a MOBA meets hero shooter; think Smite meets Overwatch. It’s a 5v5 hero shooter that requires strategy, where team composition could make all the difference between winning and losing (just like in Overwatch). The game has healers, damage dealers, and tanks just like most games in the genre, so there’s nothing new there, but there are also shooters, fighters, summoners, and other sort-of subcategories. However, the character designs are absolutely brilliant. Take HK-206, for instance, a crazed robot that plays like D.va meets Bastion (and no, he’s not a rip-off of those two by any means, but that’s just the best way to describe his abilities). Then there’s Tripp, a lightning quick assassin who can put out some damage. Wu, a fighting frog that uses his tongue as a weapon. Mozu, a teleporting wombat-looking thing who can teleport her way around each map. The Margrave, who lost his hand in battle and has replaced it with the hand of a demon, allowing him to not only take a ton of damage but also deal as well. One of the most interesting characters, in my opinion, is Aisling, a young girl who not only uses her dead father’s sword but fights alongside her dead father’s ghost. Of course, those are just a handful of the cool character ideas in Gigantic, and there is a total of 19 heroes to choose from. It’s the synergy created by unique combinations of these characters that could push your team to victory in a Gigantic match. The idea is to gain enough points in each match to have your guardian pin the other team’s guardian three times, allowing you to deal damage to the opposing guardian and lead your team to victory. Your team gains points by killing opposing players, capturing points, and summoning creatures. Gigantic is a highly competitive game, and the battles are relatively longer than you might expect. It’s a game that we’re enjoying quite a bit at the moment, so we figured we’d shine a light on it in hopes that our readers might find some enjoyment out of it as well. 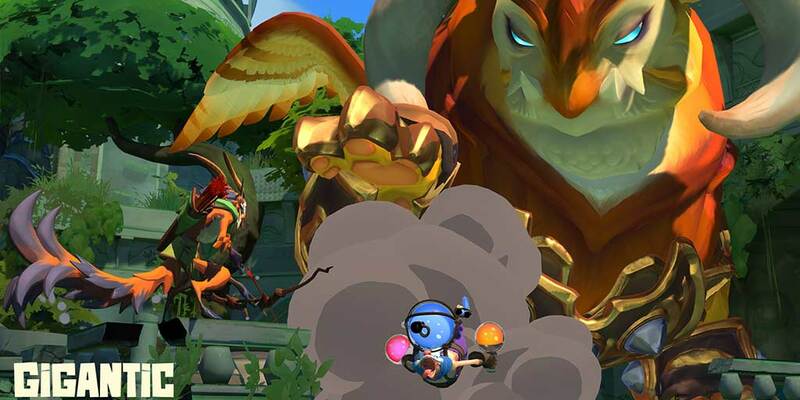 Between your backlog and the new games that we’ve already seen release this month (like Splatoon 2 and Albion Online), we know it’s going to be hard to not let Gigantic slip through your fingers. But, if you find yourself with some free time this weekend, we urge you to download it,Gigantic, complete the tutorial, and give a few matches a go. If you find yourself enjoying it, let us know that we aren’t crazy in the comments below or on Twitter.